I convinced them to consider a projector/screen combination rather than a plasma. They didn’t want to always be in a dark environment and I explained how current projectors and screen combos provide a high level of quality even in high ambient light conditions. 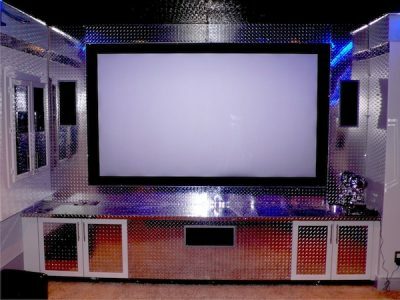 Since both the homeowners were unanimous that The Terminator was their favorite movie, it seemed natural to transform their 14’ x 21’ bare room into a “Terminator” themed theatre. The adventure had begun. This had to be an over-the-top theatre so I watched all the Terminator movies from the beginning that night well into the morning, taking notes on set design, shooting locations, and what elements we could integrate into the design. The majority of the design elements were inspired by the second movie: T2 – Judgement Day. Our design team was to give a fresh spin on the vault in the Cyberdyne building where the T-800 arm and chip were housed in the movie. Seeing as this was supposed to be a vault, the original door was replaced with a steel door, the door frame was built out and covered in aluminum plate with the trademark vault bolts surrounding the frame on both sides of the entrance. A decoy security camera pans back and forth activated by a motion sensor. A customized “Skynet Research Containment Facility” sign was placed next to the entrance to complete the illusion. The colors and decor were based on the lobby entrance of the Cyberdyne building. Special drywall techniques were used to replicate the ‘layered’ effect of the lobby wall panels. The “research components” consisted of a full-scale endoskull modified to have the eyes glow red at the push of a button. There is a scale Sideshow collectible Endoarm and a custom-fabricated Neural Chip placed here. Specially machined metal serial number plates with fabricated tech specs flank the airtight sealed display boxes. A custom made stainless steel /acrylic LED Cyberdyne logo is located above the screen. The electrical panel was stealthy installed inside the theatre behind the cabinet doors to the left of the front wall. However, all the electronic components were housed in the mechanical room, three rooms away. Since this was going to be an industrial style decor anyway, the decision was made to run an oversized exposed armoured electrical cable across the ceiling and into the cold air return. A second hollow armoured cable run would be used to house the video and control cabling to the projector . The cabinet doors were trimmed with diamond plate inserts and Halon control/First Aid signs to hide the electrical panel location. To further the industrial look, large laser cut foam gears were designed as a centrepiece on the ceiling to take attention away from the conduit runs. The entire ceiling was surrounded by a custom made “I-Beam” made of MDF, with a metallic look. The LED lighting was installed in the I-Beam to provide the appropriate eerie blue glow. The LED lighting is controlled via a URC MX-3000 touchscreen through 6 RF dimmers and switches. The standard hush box we normally use to house the projector would not work with this design, so an open design was utilized to ensure adequate ventilation. The hydraulic arms used to hold the diamond plate shelf were custom built from scratch using various types of metal rods, piping, wiring, hoses, MDF and assorted hardware. Using the Panasonic PTAE4000 projector’s quiet fan and superb picture helped maintain the design and kept the video under budget. A Screen Innovations Black Diamond HD fixed screen was coupled with the Panasonic to enable the video system to be used with the lights at any desired level without sacrificing picture quality. The robotic plane appears to come out of the back wall of the theatre and is a full-scale (6 feet wingspan) replica of the Hunter Killer aerial drone that flies through the hallway of the Skynet facility in the third Terminator movie. The plane was painstakingly carved entirely out of high density Styrofoam over two weeks. Various metal and wood elements were used to create the underwing missiles, cameras, spot lights, machine guns and plasma cannons. Remote controlled LED lights give the “Eyes” the red evil color. Time consuming sanding & painting techniques and multiple coats were used to create the brushed metallic finish. Finally, over $2000 worth of diamond plate aluminum sheeting was used to cover the entire proscenium, door inserts, and speaker columns. Using all of this metal should have had an adverse affect on the sound quality, but actually improved it by creating the perfect reflection points so very little had to be done as far as acoustics after calibration.